Before you jump in, I have to warn you that this review is for the people who already beat Portal. I’m going to spice things up a bit since this game is far past its prime. If for some reason, you were living in a cave or you never jumped on the bandwagon, then this review will contain some major spoilers. Portal was my first exposure to FPS games which takes a lot of pure concentration and fast aiming reflexes. 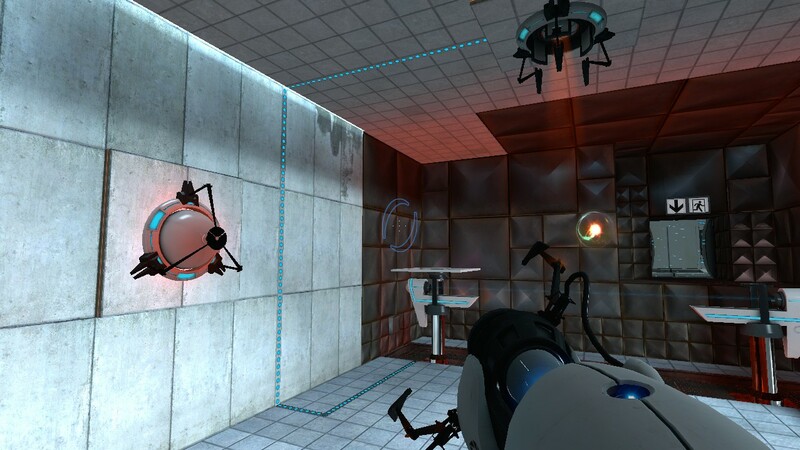 Portal is an action-packed Valve game taking place inside the pristine and mysterious Aperture Science testing center. 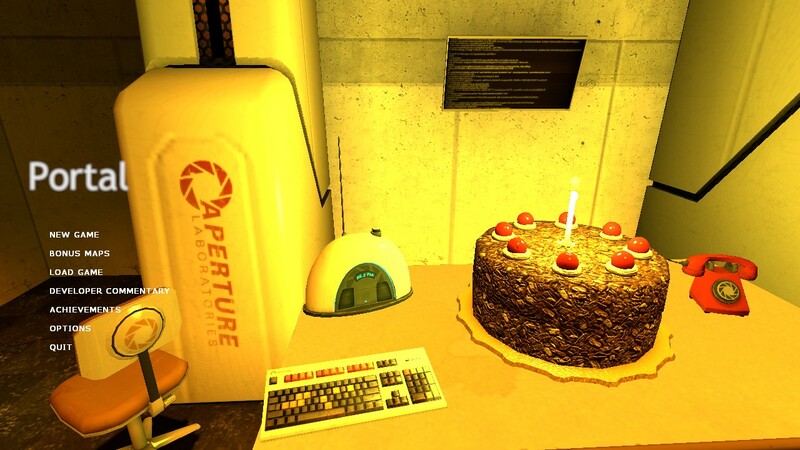 Here is a fun history lesson on how Portal came to exist as the award-winning game it is today. I already finished it long ago, back in 2014 with Paul who dropped a few hints on where to place the portals. At first, I was impressed by people who recorded playthroughs of Portal because they were able to speed run it in under an hour while I kept dying on every other test I’ll be going into which games influenced Portal’s gameplay. An interesting fact about Portal is the inspiration behind its release in the Orange Box bundle. The portal system was invented by the creators of Narbacular Drop, a fantasy-themed puzzle game that allows players move objects around using interconnected portals. 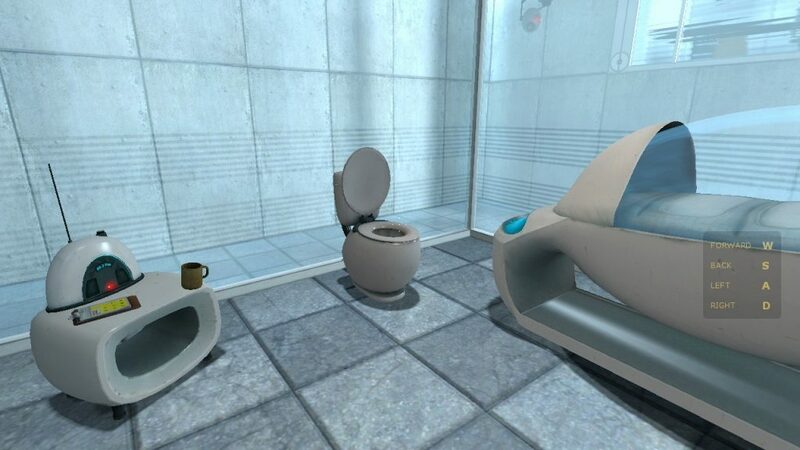 Valve decided to hire their whole team on board to design the core concept of Portal as we know it today. One thing I noticed about Portal is the low budget textures. Evidently, the dev team didn’t have many assets to work with. They took Half-Life’s resource packs to build the enrichment center. The sound effects for pressing buttons and character movements are identical. Both games take place in the same universe, what a coincidence! Help! The toilet is talking to me! You play as a woman named Chell who is likely the sole survivor of “Bring Your Daughter to Work” Day when GLaDOS flooded the enrichment center with a deadly neurotoxin. 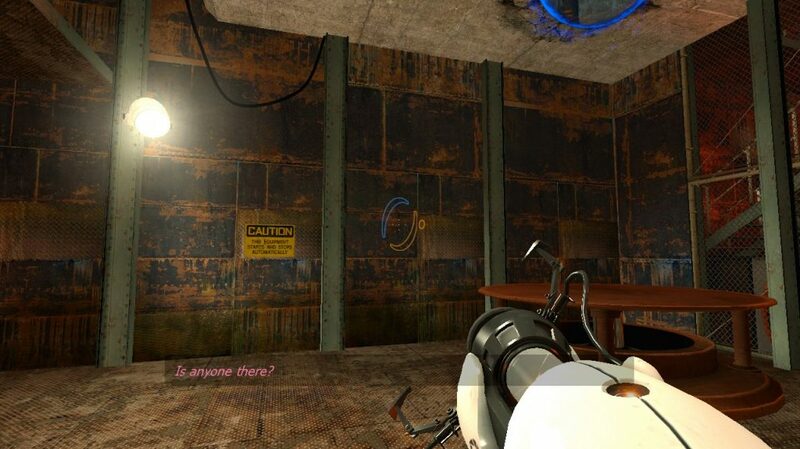 Since the game is in first-person, you can only see Chell by placing two portals on a corner. The long-fall boots prevent her from taking fall damage. Portal physics follows the law of gravity…with some strange twists. Portals are dimensional gateways from point A to B. You obtain the blue portal gun but it is later modified so you are able to create two linking portals, one blue, one orange. Like an instant teleporter, you are transported from one area to another. Hint: Turrets can’t shoot behind them. Portal is all about how you approach an objective, by manipulating your surroundings or determining every possible route before you execute a plan. More importantly, are you able to run and shoot at the same time? Understanding how to solve the puzzles is only the tip of the iceberg; There are many deathtraps to avoid. The key to “thinking with Portals” is to fire portals at visible white surfaces to access new areas. You will be moving weighted storage cubes, directing high energy pellets, building momentum, activating buttons, crossing over acid pits, and disabling those deadly turrets. With your trusty handheld portal gun, you should have no trouble getting past these obstacles. 11 Chapters = 19 Testchambers? 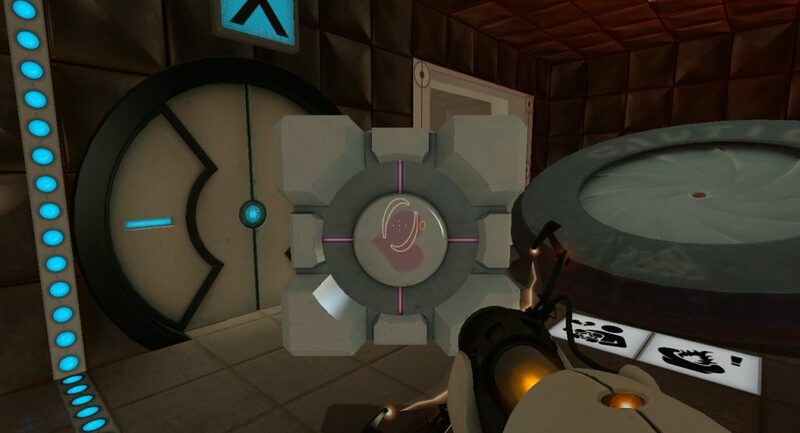 Aperture Laboratories operates 19 test chambers that gradually introduces more difficult puzzles. To be honest, the first five test chambers are a breeze: It consisted of placing storage cubes on big red buttons. Basically, light up all the checkmarks that happen to connect to an energy pellet catchers or opens the main exit. The game likes to drop hints everywhere if you’ve seen the floor stick-figure diagrams and ceiling dominos indicating where to fire portals. In addition, the energy ball receptacles reflect light onto the walls so you know how to make a path towards it. Turrets have their sensor beams on so you are aware of their line of sight. This brings back bad memories. Timing is of the essence when you attempt multiple maneuvers. For example the non-stationary scaffolds in Test 15 slide under a wall; you are given limited time to hop on the platform. The small vertical buttons temporarily open a doorway for you to put down a portal. The signs indicate the potential hazards of each test chamber such as the hazardous acid floor. The later stages are no joke. Test 16 has stationed turrets that fire a continuous stream of bullets. You could be vaporized by high energy pellets in Test 17, blocking your path. Test 18 even requires you to shoot portals while falling in mid-air. The most intense part of Portal is definitely at the end of Test 19 where the platform you’re standing on descends into an incinerator pit. At that instant, I realized there was never gonna be any cake. The rest is history. But Chell is determined to escape the facility by going “behind the scenes”. Chell is able to outsmart GLaDOS by traveling into the maintenance areas of the complex. There are empty offices with computers still running, large steel pistons and fans block your way. The walls are filthy and the stairs fall down when you use them. She has to ride in a transport tube at times and sneak past the turrets in a sewer. 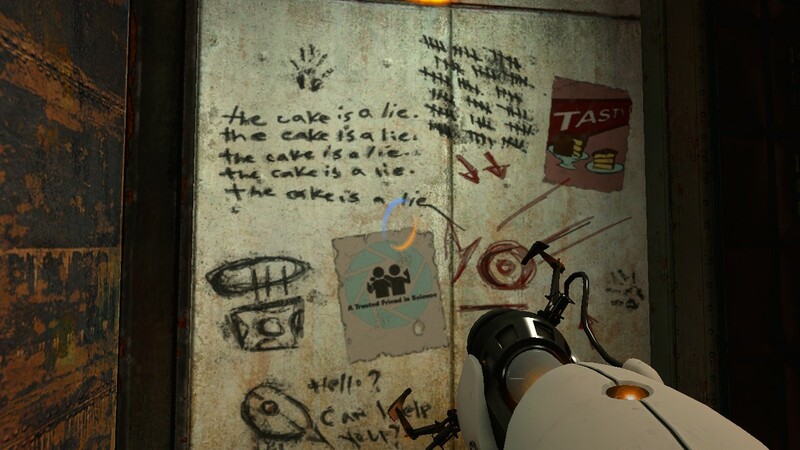 At first, GLaDOS pleads with Chell to go back by suggesting that they are throwing a party in her favor. But the deeper you venture into Aperture Science, the more you suspect GLaDOS is behind why the laboratories are absent of any people. By the time you encounter a rocket turret, GLaDOS fully admits that she will kill you and is no longer holding back. GLaDOS stands for Genetic Lifeform and Disk Operating System. Serving as a sentient central AI built into the Aperture Science complex, she was put in charge of a huge number of human test subjects. She speaks in a robotic and cynical manner. 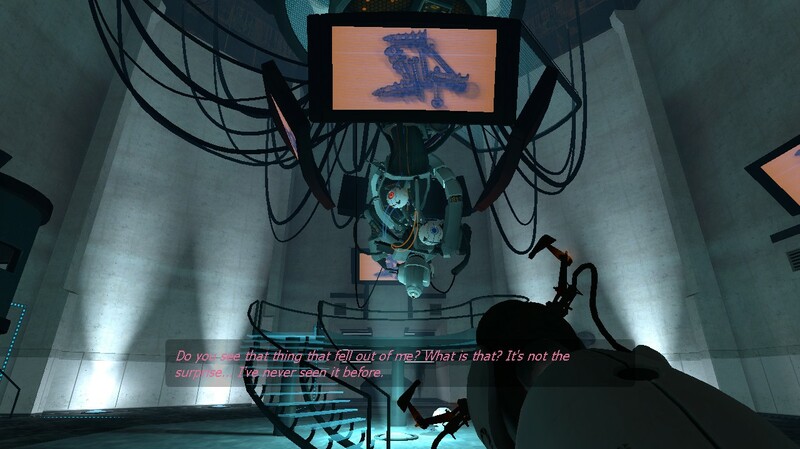 GLaDOS acts as the tutorial guide and yet, her intentions are only revealed in the end. You’ll notice that her speech cuts out at the most important parts. You are misled into thinking she has pre-recorded lines. But some of her comments are quite sinister implying she is not being fully transparent. Looking at the screens will make you dizzy. 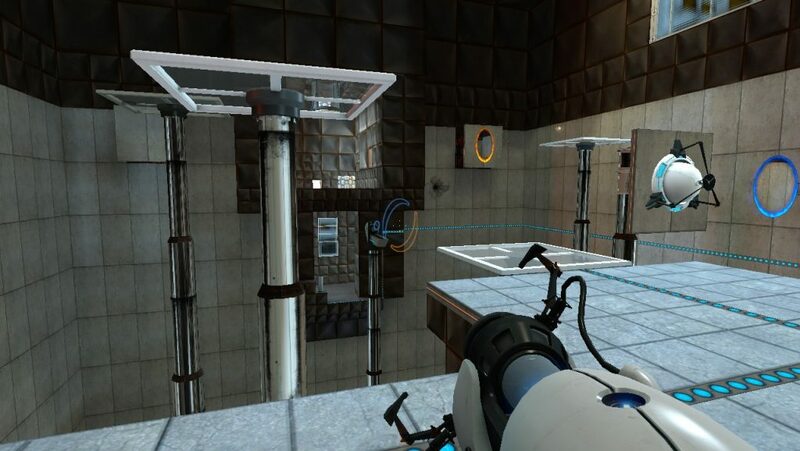 GLaDOS is obsessed with building test chambers that put you through challenging puzzles monitored on camera. Once you’ve finished the last test, you are promised cake followed by grief counseling, neither of which really happens. GLaDOS is actually hooked up to four personality cores to alter her behavior by installing a sense of morality. To distract her from a launching another killing spree, a curiosity, cake, and an anger core were added. These are the cores Chell must incinerate in order to successfully shut down GLaDOS. The anger core is the last one to destroy. It just snarls…a lot. This little guy was the best partner a test subject could ask for. He is immune to 3rd-degree burns and is great for conversation. This companion cube cannot accompany you beyond that one test. Try putting storage cubes, turrets, or cameras through the Material Emancipation Grid. Grab the radios that play “Still Alive” will net you the Transmission Received achievement. 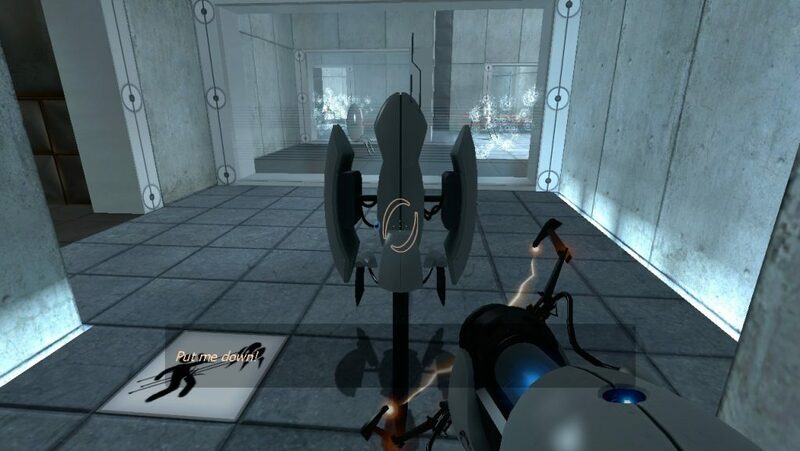 Firing portals at the security cameras will cause GLaDOS to ask that you stop destroying “vital testing apparatus”. Hold a sentry turret and walk into the line of sight of another turret. Test your skills on the bonus maps with fewer safety nets to stand on. Choose between advanced maps or complete challenging goals. You can crawl under vents to see where Doug Rattmann was hiding. And remember, the Cake is a lie.